High above the Kona coast, in the cloud forests that rise up the slopes of Mauna Loa, the climate is just right for growing coffee. The bushes rise up above the twisting Hawaii Belt Road, disappearing into the mist that shrouds the slopes. 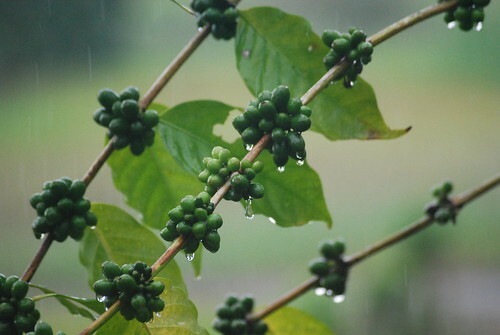 It was pouring with tropical rain when we visited Greenwell, one of the many coffee growers on Big Island, where you can watch coffee move from cherry to bean, and then taste the final roast. It's one of the oldest coffee farms on the island, and the bushes grow tall and strong. The coffee cherry is ripe when it's red., but the green fresh cherries covered the bushes in a riot of embyronic caffeine.